J/News Articles: Nations Cup Grand Final Sailing J/22s! 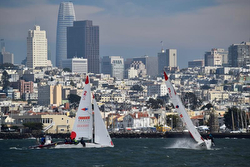 (San Francisco, CA)- St. Francis Yacht Club in San Francisco, CA has been selected by World Sailing, the world governing body of the sport, to host the 2019 Nations Cup Grand Final from April 9th to 14th, 2019 and will use its matched fleet of J/22 one-design sailboats. St. Francis Yacht Club previously hosted the Nations Cup back in 1995 using J/24s. Ten Open and ten Women’s division skippers have registered for the Grand Final, including some of the top world-ranked skippers from various countries. As winners of the last Nations Cup Grand Final, USA’s Nicole Breault earned a spot in the Women’s division and Russia’s Vladimir Lipavsky earned a spot in the Open. World Sailing Member National Authorities (MNA) filled out the field by nominating their most recent National Match Racing Champions in each division. Nominations were allocated by region to Africa, Asia, Europe, North America & Caribbean, Oceania and South America, and the event will have ten countries represented in the Open and eight countries in the Women’s. For more Nations Cup Grand Final sailing information Add to Flipboard Magazine.